Luggage Reviews – Who Are These Experts? It can be helpful to read luggage reviews prior to buying your new luggage. Good review highlights the pros and cons of the particular product and can help you to decide which product to go for. You will come across two types of luggage and bag reviews online, experts' reviewers and users' reviews. Both types of reviews can be of great value when choosing your bag. There are though few things worth having in mind when reading any luggage review. Expert luggage reviews should offer you unbiased advice and as such can be very useful to help you find the right luggage for your travel needs. But what makes someone a luggage specialist? And how do you know if he or she is unbiased? Being an expert in luggage is not a trade and no school graduates luggage experts. Strictly speaking, anyone can claim to be a luggage specialist. This means there are different kinds of experts around and their knowledge of luggage varies, i.e. their level of expertise. 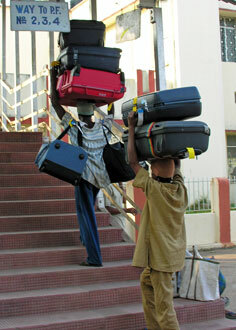 Some are experts because they have career in the luggage business, e.g. selling or manufacturing luggage. Others have travelled extensively and their practical experience has given them valuable insight into the different types of luggages. Others are simply passionate about luggage and have built-up extensive knowledge by researching and studying all they can about the subject. All these can claim to be luggage experts but they must clearly declare their experience for you to be able to confirm their expertise. For example, our B for Bags luggage expertise is based on our extensive travel experience and passion, as well as substantial research into the subject as part of building this website. How Unbiased Are Luggage Experts? How unbiased is anyone? Let's face it we all have our opinions and views. However, good luggage specialists will keep their opinions and views to themselves and concentrate on the particular product, i.e. what are the pros and cons, the benefits, the downsides for the user, etc. And if the luggage specialist has interests in the product, e.g. is selling or manufacturing the product, then he or she should clearly state their interests. They should do this within their website Disclaimer, like we have done, or as a footnote at the end of their review. Having interests in the product does not make the luggage expert any less of an expert. It is actually likely to make him or her more of an expert. Those who have interests in something tend to know more about the subject than those that don't have any interests. Nevertheless, in all circumstances, these interests should be clearly visible to all to see. Reading reviews from those who have bought and used the product can be very helpful when deciding what bag to buy. Users' reviews though tend to be anonymous so you should take them with a "pinch of salt". False positive and false negative users review are not unheard of. The more users' reviews the better though many bag reviews are no guarantee that they are all genuine. However, you should be able to tell the authentic from the false one in most cases. The false ones tend to be brief and similar, while well-written, detailed, unique luggage reviews tend to be authentic. Bear in mind that you do not "know" the background of an anonymous reviewer, even if he or she is genuine. It is unlikely that the user is an expert in luggage in general. He knows about this particular bag as he has used it, but may not be able to compare it satisfyingly with other bags. Neither can you tell about his or her overall style, i.e. how this person normally put things across. Some people describe something they like as good or nice, while others use best or outstanding. Some only see the positive things, while others concentrate on the negative sides. Despite all this, we recommend reading the luggage reviews you can find for the product you are interested in. They can provide valuable insight, just read them with your common sense glasses firmly on. Amazon has introduced into their customer reviews a notice stating if the reviewer has purchased the product that is being reviewed from Amazon. This is fantastic feature and shows you quickly whether the reviewer has bought the product or not. So if you do not see the Amazon Verified Purchase at the top of the review, then you know the reviewer has not purchased the product, or at least not from Amazon.